This week we are spotlighting Angel Bomb Design + Letterpress! This is also the last week to see our first DownStreet Art exhibit, Manifestos, so come down to Main St and get one last glimpse. Todd Thyberg is the owner of Angel Bomb Design + Letterpress, a Minneapolis-based graphic design and letterpress studio. He first formed Angel Bomb in 1997 and added letterpress in 2007. When not creating work for clients, he makes limited edition art prints, greeting cards and even labels his own beer. In 2011 he received an MCBA / Jerome Foundation Book Arts Fellowship in order to create The Airship, a letterpress graphic novel and in 2013 he received an Artist Initiative grant from the MN State Arts Board to create American Manifesto. American Manifesto is an activist book inspired by Thomas Paine’s Common Sense. 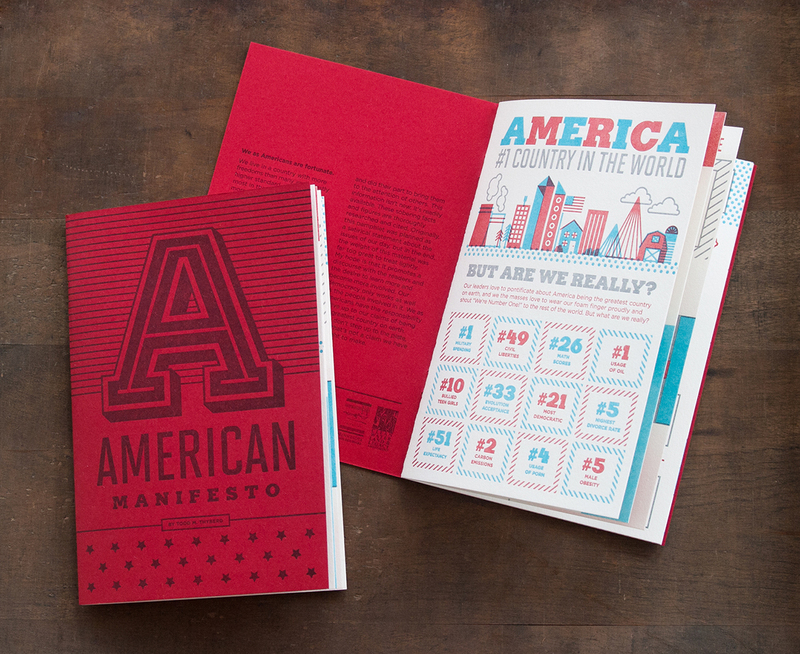 We have American Manifesto here at PRESS and looking through the boldly colored and wittily composed book is a joy for all! It coordinates wonderfully with the prints from A Revolutionary Press that hang near it and really speaks to the lasting influence and tradition of activist printmaking in America. You can visit the website http://www.angelbomb.com or email info@angelbomb.com to find out more. Tags: Angel Bomb, Holstee, Letterpress manifestos, manifestos. Bookmark the permalink.